Glass Molding: Precision Glass Molding Manufacturer | Rayotek Scientific Inc.
Rayotek specializes in slumping and molding soda lime glass, borosilicate** (Pyrex™), fused quartz, fused silica, and glass ceramic for industries where the quality, purity, mechanical and optical characteristics of glass are critical. 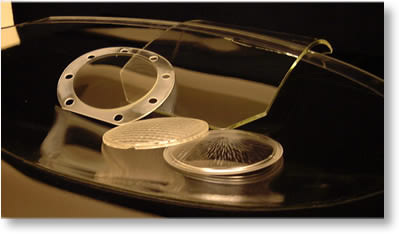 We provide glass molding and slumping for a wide range of industries. We excel in precision glass molding and slumping to create both simple and complex curves and shapes with tolerances comparable to precision ground parts. For most high-volume applications, our precision glass molding process is much faster and far more cost effective than traditional grinding processes. **Borosilicate, an 'engineered' glass, is commonly known as Pyrex™ by Corning, and Duran™ by Schott Glass. Borosilicate molding is used when the thermal, mechanical and chemical conditions are too much for standard glass. The relatively low material cost and ease of borosilicate molding make it an excellent choice in many applications. The low coefficient of expansion makes borosilicate the best choice for thermal environments. It is thermally stable up to 450C for continuous use and 600C for short periods. Additionally, the minimal devitrification occurring during borosilicate molding means high quality surfaces can be maintained.